Most 6-months-old babies actively engage in the sights, sounds, and tastes of their environment. Parents and caregivers can stimulate sensory development through language and play. Talk to your baby about what is happening in the environment, and stimulate baby’s senses with age-appropriate toys. By this age, most babies are engaging actively with their caregivers. 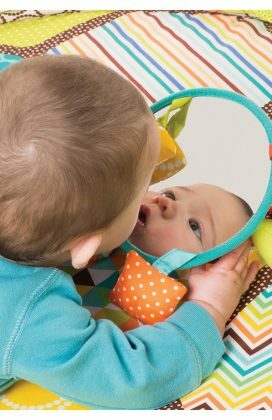 Infants like to play and smile, react to the emotions of others, and look at themselves in a mirror. These babies are babbling and responding to sounds and their name. Many 6-month-olds can stand with support and enjoy bouncing. Babies at this age also love to put everything in their mouths. 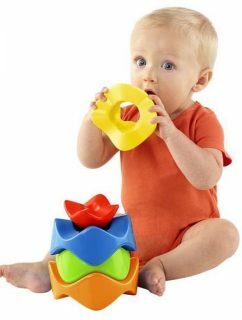 Mouthing objects lets baby discover the taste and texture of the object. Keep choking hazards out of baby’s reach. It’s important to pay attention to the age-rating and small parts warnings when purchasing baby toys. Toys rated 0 months, 3 months, or 6 months+ are designed to be safe for 6-month-old infants. Let baby engage with the surroundings in a safe, colorful environment with the Infantino Go GaGa Activity Gym & Shape Sorting Ball Pit. 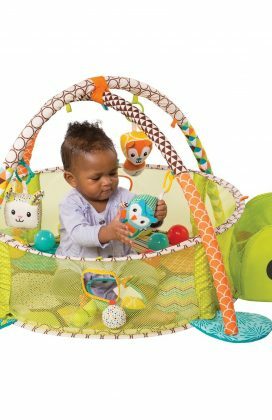 6-month-olds will have a ball with this transforming combination activity gym and ball pit. This unique product converts from a flat play mat into a sensory-stimulating ball pit that will grow with your child through infancy and into toddlerhood. This interactive gym helps strengthen your infant’s physical development by encouraging tummy time and seated play. The soft animals play music and can be sorted into the shape holes on the mesh sides. 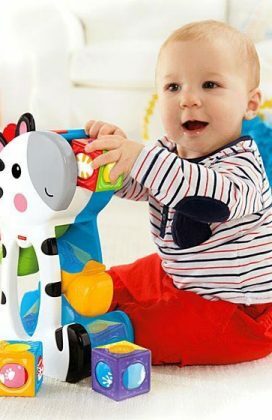 The Fisher-Price Laugh & Learn Smart Stages Puppy make a great gift for a six-month-old. 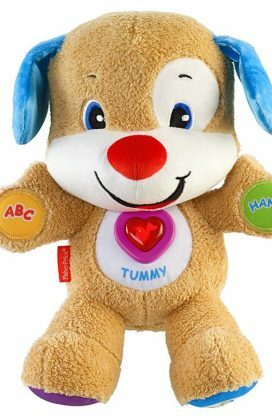 This soft puppy has 3 learning levels to maintain interest and promote development as your child grows. 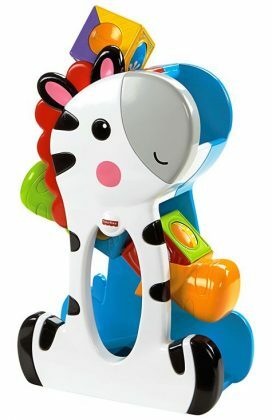 The puppy plays a variety of developmentally appropriate songs, sounds, and phrases at each level. 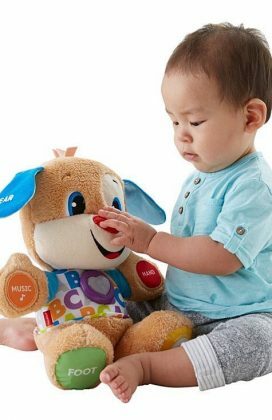 While interacting with this cuddly toy at level one, your baby hears more than 100 first vocabulary words including shapes, body parts, colors, and more. When set to level two, the puppy will encourage little ones to count along and identify body parts. The third level encourages pretend play and sing-alongs to expand vocabulary. Baby learns cause and effect by discovering what happens when you touch different parts of the puppy. 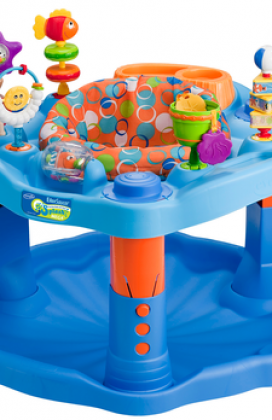 Engage baby’s senses and spark imagination with the Mega Splash Activity Center. This stationary, beach-themed play area for babies who can stand while supported, but cannot walk yet—perfect for a developing 6-month-old. A variety of toys engage baby’s fine and gross motor development. The moving toys also encourage visual and tactile awareness. 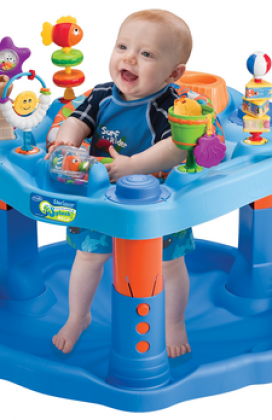 This stationary exersaucer allows baby to bounce, spin, and rock while staying safely in one spot. The colorful shapes and toys promote mental and physical stimulation, cause and effect learning, and hand-eye coordination. The ingenious Oball Anyway Stacker features 5 uniquely designed pieces that fit together in any order. Baby can stack them on the top, bottom, or in the middle, and they fit together every time. This encourages creativity and problem-solving as baby discovers different ways to fit the pieces together. Picking up objects and placing them develops important skills such as intentional grasp and release. Babies are still developing dexterity and fine motor control, so these chunky shapes are just the right size for little hands to grasp. As babies stack they must visual gauge where the pieces need to go in relationship to themselves and the other pieces. Stacking pieces on top of one another promotes depth perception, hand-eye coordination, and spacial awareness. The Roll & Explore Symphony Ball exposes baby to a symphony of music, instruments, and animal sounds. Bright flashing lights provide visual stimulation. This toy features three modes: music, composer, and discovery. In music mode, the ball plays 12 different classical melodies that speed up or slow down depending on how fast the ball is moving. In composer mode, baby can add or remove instruments with the touch of a button. This promotes cause and effect learning. Discovery mode lets baby hear the names of the instruments and colors in English, French, and Spanish. This mode also has fun animal sounds. 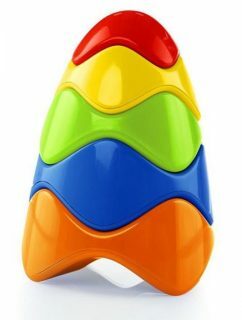 This toy engages baby’s motor skills and mental development. 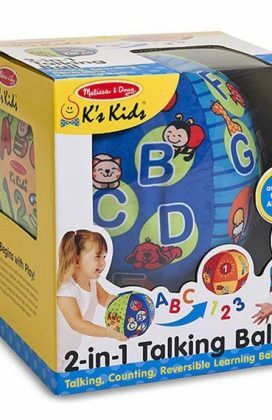 The 2-in-1 Talking Ball introduces baby to language, ABCs, and counting. 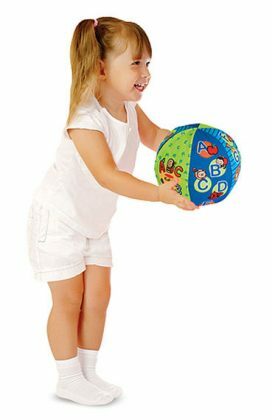 This ball has reversible fabric panels and two modes that expose baby to alphabet and counting. A flip of a switch lets you select your preferred mode. The soft ball is great for indoor tossing, catching, kicking, and rolling. 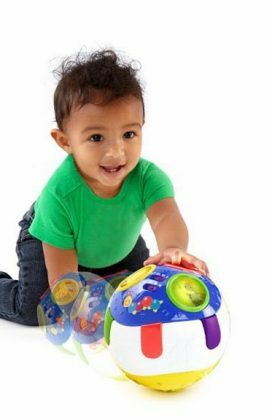 Promote the development of gross motor skills as baby plays with this noisy, talking ball. The bright graphics add delightful visual stimulation. This ball is a wonderful way to introduce early learning topics through physical play. The toy is designed to introduce learning at the child’s own pace and encourage physical, cognitive, and social development. The Roller Blocks Tumblin’ Zebra provides so many ways to entertain baby. The product comes with three roller blocks and a drop-through zebra that waves its hands as the blocks fall down. The blocks will change which size they come out on, keeping baby surprised and engaged. There is a place on the zebras head for stacking the blocks. The blocks can be stacked, spun, or tumbled. Grasping and stacking blocks builds motor development and hand-eye coordination. Bright colors provide visual stimulation. Dropping the roller blocks through the zebra makes exciting things happen, which strengths baby’s understanding of cause and effect. 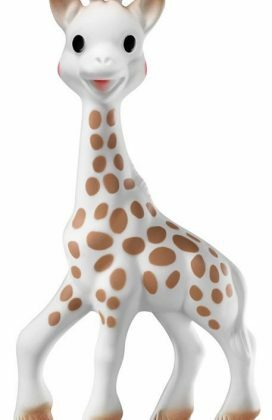 Sophie la Girafe (Sophie the Giraffe) is a classic French baby toy and teether that has been popular since 1961. The hand-painted dark contrasting spots that cover Sophie’s giraffe body give visual stimulation and creates recognition. Sophie can become a familiar comfort object for some babies. Her squeaker stimulates hearing, entertains baby, and demonstrates cause and effect. The natural rubber toy is flexible with many bumps and parts for baby to explore while mouthing and playing. The long legs make a soothing teether for baby’s hard to reach molars. This toy is made with natural rubber and food-grade paint. Small and light, Sophie is just the right size for little hands to grip.